If you were confused by The Da Vinci Code, this won't help. (That refers to the Latin Kingdom of Jerusalem, founded as a result of the First Crusade in 1099 and finally falling in 1291). 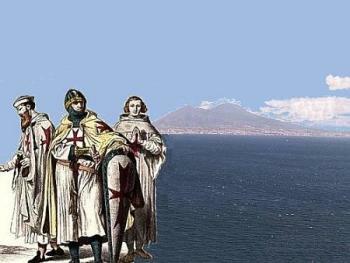 Nocera [near Naples] is the birthplace of Hugo de Paganis(Payus), one of the founders of the Templars. So, which is it? Hugues de Payens (from the Château Payns), in Champagne, France? 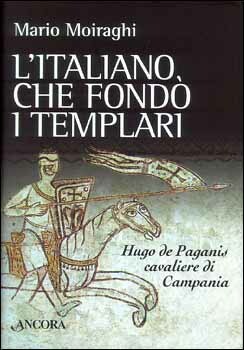 or Hugo de Paganis from Nocera dei Pagani? (...today, the town of Nocera Inferiore) in Campania, just down the autostrada from where I sit. Wait, you say —those two names, Hugues de Payens and Hugo de Paganis sound...uh...similar, maybe the same. (Uh-oh. You, too, now see that "Campania" looks a lot like "Champagne." Your head hurts.) Aren't they talking about the same guy? I don't know. I told you someone is confused. In any event, this first great group of "warrior monks," the Knights Templar (which name derives from the "temple" of Solomon, their first headquarters in Jerusalem) was an important international military and financial institution throughout the Christian west until it was charged with heresy and other crimes by the French Inquisition under the influence of the French King Philip IV (Philip the Fair) and was forcibly disbanded in the early 1300s. At the height of their power and influence, the order fielded a large army, answered only to the Church and not the temporal princes of the earth, had acquired large tracts of land both in Europe and the Middle East, built churches and castles, was involved in manufacturing and trade, and had its own fleet of ships. In their two centuries of glory, the Templars owned considerable land in southern Italy; they established themselves in Barletta, Matera, Brindisi, Foggia, among other places, and operated monastery-like estates, trading, and resupplying their soldiers in the Holy Land from the ports of Puglia. That much has always been uncontroversial. In any case, Nocera is still there, as it has been ever since it was founded by the Etruscans in 600 b.c. It was sacked by Hannibal, was a Saracen colony for a while (hence "paganis"), almost destroyed by Roger, first king of the Kingdom of Sicily (and Naples), and was smack in the path of the Anglo-American invasion at Salerno in WW2. A little more controversy won't hurt. I have a few students from Nocera at the Orientale university in Naples; they have been unable to confirm or deny that their home town is cashing in on this. Maybe a Knights Templar Pizzeria.